Following is an indepth story by the Wall Street Journal about the Mueller report. 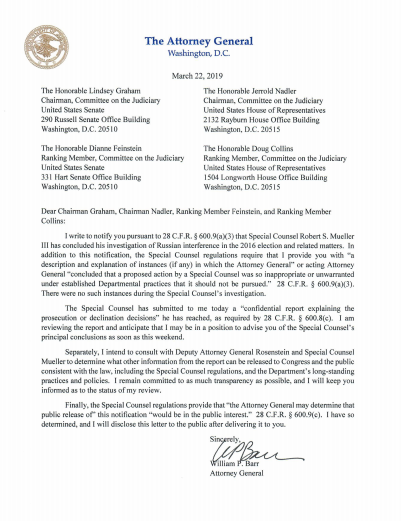 A link to the letter by Attorney General Barr is included. Below that is a video report by WSJ’s Jason Bellini which breaks down the investigation by the numbers, including the costs. WSJ: Special counsel Robert Mueller presented his long-awaited report to the Justice Department on Friday, ending his nearly two-year investigation that has loomed over the Trump presidency and likely setting up a political battle over what he has found. In a letter to the majority and minority leaders of the House and Senate Judiciary Committees, Attorney General William Barr said Mr. Mueller had concluded his investigation of Russian interference in the 2016 election and related matters, and he said he would be able to alert Congress to Mr. Mueller’s “principal conclusions” as soon as this weekend. Those conclusions are expected to be made public, though it remains unclear whether Mr. Barr will at some point release the full report, which President Trump and lawmakers from both parties have called for. If he doesn’t, he could face a tussle with Congress. The special counsel isn’t recommending any further indictments, according to a senior Justice Department official, in a wide-ranging inquiry that has yielded criminal charges against 34 people and the convictions of five Trump advisers. Even as the Mueller probe is ending, other legal threads involving the president and his allies will carry on under other jurisdictions. Mueller Investigation: 674 Days, and Other Numbers to Remember.